Tea drinking never became as fashionable in France as in other European countries. But the practice existed at an aristocratic level as an alternative to the usual coffee and chocolate. So-called cabaret sets or déjeuners consisted of complete services on a tray for just one or two people. The Vincennes/Sèvres factory gave them the most luxurious treatment, since its patrons were the wealthiest members of French society. The tray with this tea service was known as corbeille lozange and it was designed by Jean-Claude Duplessis, directeur artistique at the porcelain factory. Originially the shape was intended as a desert serving dish and was included in the first full service made at Vincennes, ordered by the King, Louis XV in 1753 and delivered 1753-55. These were decorated with a deep turquoise ground, flower sprays and gilded with rose thorn borders, and were among the most expensive individual items in the service, costing 480 livres each. Surviving examples from the king's service show that they were all thickly potted and prone to damage in the kiln. Perhaps for this reason, unlike the other shapes, they were rarely re-used and are seldom found today. Here this unusual shape serves as a tray for a tea service, a déjeuner corbeille, and fortunately the matching cups and saucers, teapot and sugar bowl have all survived. 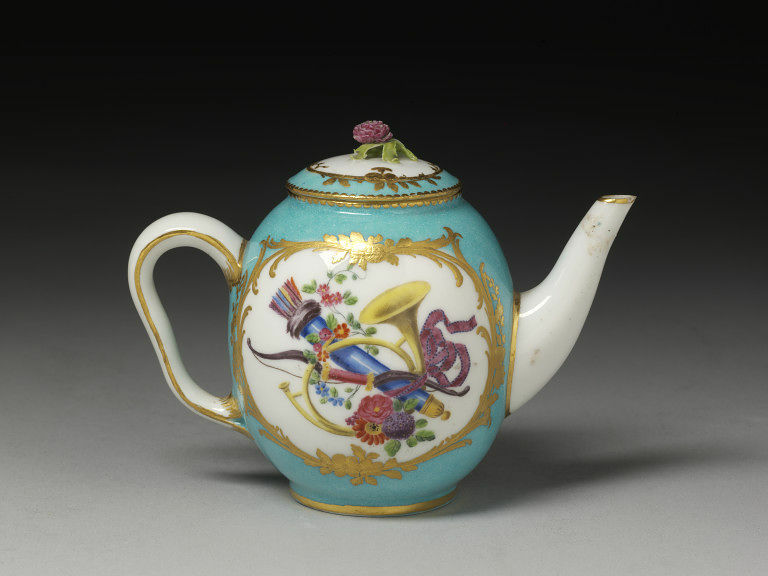 The teapot, like most of the other items, is marked with the date-letter H for 1761 and the anchor symbol for the painter Buteux. Charles Buteux specialised in trophies, depictions of themed objects carefully arranged into artful groups. The objects in the trophy on the tray relate to astronomy, geography and navigation, while those on the other pieces relate to love, music, travel and wine. 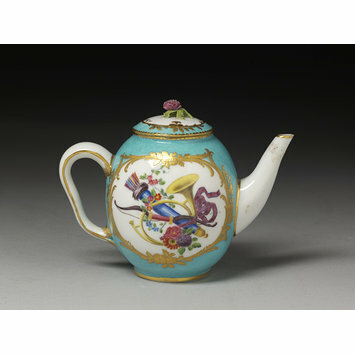 The ground colour is a pale turquoise, known as petit verd which as Rosalind Savill has pointed out, is also unusual and seems to be found only on pieces dating to the early 1760s. Perhaps the King's influential mistress, the marquise de Pompadour, was responsible for popularising it at court, as she is known to have bought a petit verd garniture of a clock and two pairs of vases in 1762. John Jones Bequest, Cat. no.118. Peters, David. An examination of Vincennes and early Sèvres date letters. The French Porcelain Society, A transcript of the talk given at the French Porcelain Society Study Day on 17 June 2014. London, 2014. According to Peters' new examination of the date letters against the existing records, 'h' is for 1761, not 1760-61 as formerly thought.